Today we have conveyed to you another arrangement of Current Affairs Updates for 27th May 2018. We trust every one of you are getting ready well for the exams, for example, IBPS PO, RRB, Railway ALP, Railway Group D, IBPS CLERK, SSC CGL and SSC CHSL. Many of you seem to be confused while planning for Current Affairs so we are here to help every one of you to choose just those which are important to your Competitive Examinations. 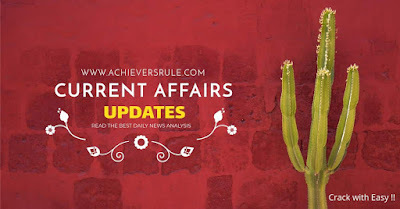 We trust per users will experience these in points of interest and will likewise take after the Daily Current Affairs Quiz to have a keep an eye on their level of arrangement. Rajasekharan will succeed Lt General Nirbhay Sharma (retd) as Governor of Mizoram. The Barbados Labour Party (BLP) has won the country's 2018 General Elections claiming all 30 seats in the country's House of Assembly and unseating the Democratic Labour Party (DLP), which has governed the country since 2008. The crushing victory for the BLP means that its political leader Mia Amor Mottley will be sworn in as Barbados' first female Prime Minister since the country gained independence from Britain in 1966. The finance ministry had ratified 8.55 per cent rate of interest on EPF for the last fiscal. But it could not be implemented because of model code of conduct for Karnataka elections. Prime Minister Narendra Modi laid foundation stones for projects worth over Rs 27,000 crore in Jharkhand, including the Sindri urea plant. The urea plants of Sindri, Baruni (Bihar) and Gorakhpur in Uttar Pradesh will help in the second agriculture revolution in the eastern India. The Indian Navy commissioned its third Landing Craft Utility (LCU) Mk-IV in a ceremony at Port Blair . The North Zone Cultural Centre (NZCC), Patiala has been entrusted with the responsibility as the nodal agency to carry forward the execution of the National Cultural Festival under the banner of the slogan “EK BHARAT SHRESHTHA BHARAT”. PM Modi, along with his Bangladeshi counterpart Sheikh Hasina, will attend the convocation of Visva Bharati University and inaugurate the Bangladesh Bhavan at Shantiniketan. PM Narendra Modi laid foundation stone for first phase of NTPC’s coal based Patratu Super Thermal Power Project in Jharkhand. The project is 74: 26 Joint Venture between Government of Jharkhand (GoJ) and Patratu Vidyut Utpadan Nigam Ltd. (PVUN), a subsidiary company of NTPC. The second stage of Archery World Cup 2018 started in Antalya, Turkey. India opened its account with a silver and a bronze medal in the compound section.